SAIP, Papar (Saturday) - The Sabah Economic Development and Investment Authority (SEDIA) today received a visit at the Sabah Agro-Industrial Precinct (SAIP) by officials of the Ministry of Energy, Science, Technology, Environment and Climate Change (MESTECC). The visit by MESTECC involved one of its agencies, the National Institute of Biotechnology Malaysia (NIBM), and is a first in a series of visits by the MOSTI Social Innovation (MSI) fund monitoring team. The MSI fund is a grant by the previous Ministry of Science, Technology and Innovation (MOSTI), which has been succeeded by MESTECC, with the objective of improving the well-being of society through the implementation of projects and services, capacity and skill building, or innovation output using existing technology that can be implemented sustainably. The MSI fund monitoring team ensures that recipients of the grant manage to implement the programmes smoothly. The purpose of their visit today was focused on monitoring the infrastructure and functionality of the mushroom house system, mushroom cultivation, and the learning and technology transfer for local technopreneurs in the industry through SMART mushroom house practices. The MSI-funded project at SAIP is the "Rural Entrepreneur Development through Grey Mushroom Cultivation" programme (MSI 16045), which realised the development of a mushroom house with SMART system functionality. The installation of sensors to control temperature and humidity parameters through the water flow adjustment, as well as an automatic fan system, ensure the production of high quality mushrooms. The main objective for developing the SMART mushroom house facility is to provide current and potential entrepreneurs with a training centre on grey oyster mushroom cultivation, particularly consistent production using sensor systems. Entrepreneurs were first given exposure to these processes through a workshop organised by SEDIA. The first phase of the workshop, "Developing rural entrepreneurs in mushroom cultivation", was held on December 16, 2016, and was followed by "Workshop Phase 2: Grey Oyster mushroom cultivation using SMART mushroom house" which was held on May 16, 2017. 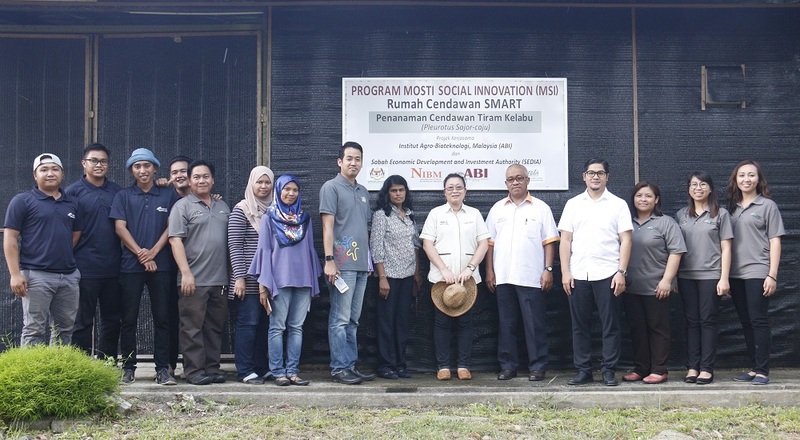 The second phase was held in conjunction with a handover ceremony, transferring the SMART mushroom house from the Agro-Biotechnology Institute Malaysia (ABI) under NIBM, to SEDIA. A total of 670.15kg Grey Oyster mushrooms have been harvested from May 2017 until May 2018. ABI had provided 11,650 blocks of grey oyster mushrooms for the SMART mushroom house programme. SAIP has been implementing "Quality Evaluation of Drying Methods and Nutritional Analysis of Pleurotus sajor caju powder" for the purposed of research, development and commercialisation. Additionally, a comparative study of grey oyster mushrooms (Pleurotus sajor caju) on different substrates and its nutrient analysis was also conducted in SAIP. Now SEDIA has begun an initiative to produce and cultivate its own mushroom blocks for self-sufficiency and maintenance of its SMART mushroom house. Located at Kimanis, in the district of Papar with an estimated area of 215 acres, SAIP is envisaged to become a centre of excellence in agro-biotechnology that optimises the state's biodiversity and abundant natural resources to produce higher value-added food and specialty products based on botanicals, aquatic plants and animals. As one of the key economic clusters under the Sabah Development Corridor (SDC), SAIP will serve as a test-bed for carrying out biotech-driven research and development and to develop biotech-driven businesses. Unlike other existing science and technology parks in other states in Malaysia, SAIP has a distinct focus on specialty natural products (SNPs), agro-biotech and health food products. SDC fiscal incentives offered for downstream agro activities at SAIP include Investment Tax Allowance of 100% for 10 years, which can be offset against statutory income. By 2017, all of the physical construction works on phases one and two of SAIP project development under SDC, together with the procurement of various machinery and equipment, have been completed. These two phases of development consist of six facility infrastructure, housing the Administration and Incubation Centre, Research, Development, Commercialisation and Innovation Laboratory, Post-Harvest Collection and Handling centre, food processing Production Line Facility, Herb Manufacturing centre, and Controlled-Environment Farming (CEF) Greenhouses. In fact, there are several SME incubatees involved in mushroom farming through CEF. The machinery and equipment at SAIP include over 45 laboratory equipment, specific for conducting plant tissue culture, horticulture research, product development, and food analysis. More than 90 types of machinery and equipment are also provided for agriculture and herb downstream processing. SAIP is also currently undergoing certification for Good Manufacturing Practices (GMP). One of the initiatives available at SAIP is the Agro-SAIP training programme, which was established with the aim of empowering technopreneurs in the agri-based industry, by giving the necessary exposure and transfer of knowledge, especially on the processing of agri-food and SNPs. Through the training programme, participants are given access to experienced speakers and industry representatives in various sectors; speakers well-versed in pharma-herbs, controlled environment farming, post-harvest handling technology, agro-organic and agro-food industries, business and marketing through e-commence, and bio-science and biotechnology had been invited to come and share their experience and expertise with participants. Designed to be a part of the SAIP pre-incubator initiative, the programme also screens and selects potential agro-technopreneurs, thus preparing them to operate under a conducive incubator business environment. As at August 2018, SEDIA had recorded close to 2,000 participants spread over 34 Agro-SAIP courses conducted since 2012.